A depressing series of news days lately. What can make us feel good? Jon Stewart? Stephen Colbert? Star Wars? How about all three? I am scheduling this for Friday, as I think that mid-APSA is the best time for some Star Wars medley mash. I could be wrong, of course. I thought Charli’s return meant I was off this beat, but what the hey. What if Shakespeare wrote Star Wars? Check it out here. With tomorrow being May 4th, it is only good and proper that we mark the eve of that most awesome of nerd holidays with this video. Twitter went nuts when President Obama said he could not get the Republicans to do what is right because of his finite powers, that he could not do some sort of Jedi mind-meld! He mixed his space franchises–Jedis may have Vulcan-like abilities, but the mind meld thing is of Star Trek. So, this sent twitter on a wonderful spiral for awhile. I thought, mistakenly, that the Hoth symposium had run its course: Ackerman point, a bunch of us counterpoint both at Danger Room and elsewhere (here at Duck, and, if it’s not up yet it will be soon, over at Grand Blog Tarkin), and my tossing a little more fuel on the fire by arguing what I generally take to be a pretty obvious and I thought uncontroversial point: that Star Wars is a story about the struggle between Jedi and Sith about the nature of the Force, with other people and organizations (like the Rebel Alliance, and the Empire itself) getting caught up in the middle of what is, basically, a theological dispute. I thought that was pretty obvious because, well, the Star Wars universe is presented to us as one in which the Force exists and is efficacious, in which some people have Force-sensitivity and others do not, and in which the greatest of galactic events derive their importance from their connection to the Jedi-Sith struggle, whether we are talking about Palpatine’s election as Chancellor or Luke’s decision to leave Tatooine with Ben Kenobi. We have fallen short of our Friday responsibilities, but given the theme of the week, this video seems most appropriate. It’s a trap. No, really, IT’S A TRAP. Change you can believe in. Or is it a trap? So our little geekfest-in-a-teacup has provoked, among other things, some additional contributions by members of The Duck focusing on additional ways that the Empire’s command structure and Imperial strategy towards the Rebel Alliance doesn’t make a lot of sense. The Imperial troops are feckless, letting the rebels escape on occasions when they should have been able to stop them easily. Opportunities to wipe out the rebels are missed through various kinds of incompetence, tactical or bureaucratic or otherwise. The Empire as a whole is riddled with inconsistencies and incoherences, clashes between divisions, competing goals, unclear budgeting priorities. And so on. 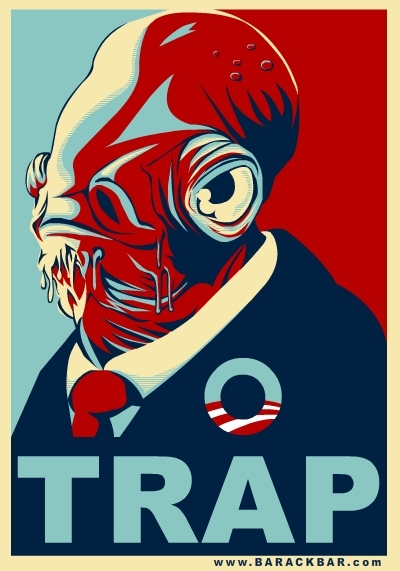 To all of that I say, along with my main Mon Calamari, Admiral Akbar: IT’S A TRAP. Really. The whole damn thing is a trap, not just specific instances of deception like the one that his most famous exclamation seems to refer to. Yes, it’s a trap that the shield generator is still working and the Death Star is operational when the rebel fleet jumps into the Endor system, but more to the point, the entire interstellar-galactic-political situation is a giant trap for the unwary, and by “the unwary” here I mean not just the various denizens of the Star Wars universe who are focusing on the wrong thing if they think that the main game in town is Empire-vs.Rebel Alliance, but also and perhaps even more profoundly the analysts who keep mistakenly treating anything that the Empire does as animated by the strategic goal of securing political rule and defeating insurgents. All of that is a sideshow, because the actual story here has nothing do with political rule; the contest is and always has been Sith vs. Jedi, which is more of a theological contest despite what misguided strategic analysts who don’t respect the conditional autonomy of constitutive ideas might think about it. So, let’s review a little basic Star Wars history (and I am going to give the grade-school textbook version here, not the C-canon version). Once upon a time there were Sith engaged in an epic battle with Jedi, but the Jedi prevailed, set up their Temple on Coruscant, and proceeded to be the guardians of peace and justice throughout the galaxy for a thousand generations, including their cooperation with the Old Republic. The Jedi order is based on the notion that the Force has two aspects, the Dark and the Light, and that only the Light has merit: they are, pretty directly, Manichaean dualists. Meanwhile the Sith bided their time, adopting the Rule Of Two — always two there are, a master and an apprentice, no more, no less — and managed to survive in the shadows, waiting. Palpatine, a.k.a. Darth Sidious, after killing his master Darth Plageous, becomes basically the single most powerful Sith Lord ever, with a command of the Dark Side of the Force to make anyone quail in terror. But even this isn’t enough against an entire galaxy that thinks of the Jedi Order as a good thing, so he launches a cunning plan to utterly destroy the Jedi by corrupting the Jedi Order (getting them involved in the Clone Wars as generals) and then turning the galaxy against them (declaring them traitors, blaming the war on them) and then killing off most of them (issuing Order 66, Vader’s rampage in the Temple). Vader then proceeds to hunt down and destroy the rest of the Jedi that he can find, and only misses Obi-Wan Kenobi and Yoda because they go into deep-cover hiding and lie very low for almost two decades. The Duck has gotten into an excellent debate with Ackerman on the Empire’s blown opportunity to stamp out the Space Vietcong Rebellion at Hoth. Westmoreland spent 5 years trying to nail down the VC in set-piece battles where US firepower could be brought decisively to bear and end the war. Here was the Emperor’s similar chance, but Vader and Admiral Ozzel blew it (mostly because the Empire’s officer corps was filled with grandstanding self-promoters, as Ackerman rightly points out). Navies are big, blunt instruments with hugely expensive platforms vulnerable to swarming, as at Yavin and Endor, and useful for large, ‘target-rich’ enemies. They scream national vanity, and they’re terrible for hunting rebels. Why does the Empire need a massive, and massively expensive, fleet after the Clone Wars? Probably because the army was staffed by mentally-hamstrung clones who couldn’t push their bureaucratic interest, while the navy had lots of fully human, showboating egos like Tarkin’s Death Star council. Episode I: Spencer Ackerman over at Danger Room posts this analysis of the Battle of Hoth. Episode III: my piece, sadly not included in the Danger Room symposium. Below the fold.